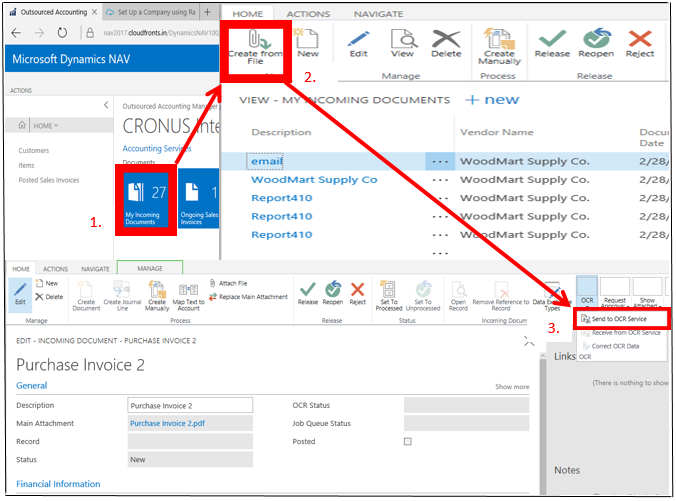 The NAV 2017 has a new feature that uses OCR technology with added item line capture functionality to automate the data entry process for vendor invoices. OCR is an abbreviation for Optical Character Recognition. Lexmark ICS (Invoice Capture Service) provides OCR Services in NAV 2016/2017. The OCR Service feature enables the user to take a picture of a vendor invoice document, sends it to Lexmark ICS Corp. and then imports the invoice back into NAV with the captured details. This saves a lot of time spent on manual entry of data into the system. 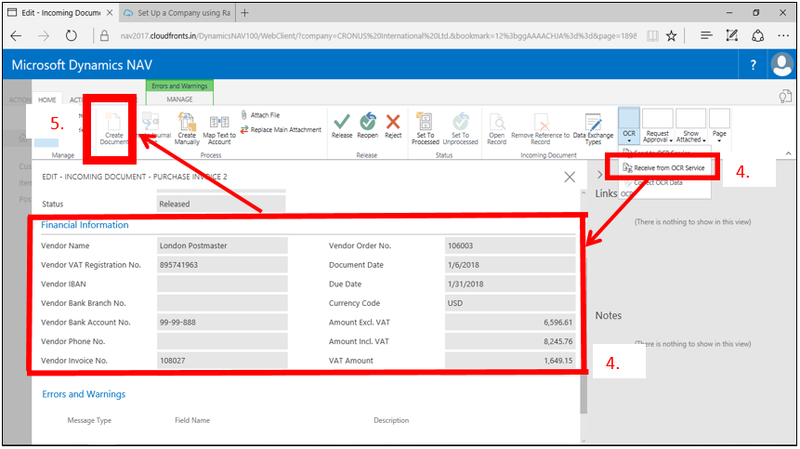 In this article, we will see how to set up and implement OCR Services in NAV 2016/2017 in three different ways. The User will click on Incoming Document option or type ‘Incoming Documents’ to open the Incoming document page. User will have to upload the Document(PDF/Image) that is to be used in the OCR Service by clicking on ‘Create from File’ option which will upload the file to the ‘Main Attachments’ of the Incoming Document in NAV. To Send the document to the OCR Service the user will have to click on the Send to ‘OCR Service’ option. After waiting for some time till the document processing is completed, User will click in the Receive form OCR Service. On receiving the OCR Service, the Financial Details gets updated in Incoming Document. If yes, then user will have to click on Create Document option to create purchase Invoice. If no, then user will have to click on Correct OCR Data option and make changes to the required fields and then on Click Send OCR Feedback to correct the OCR Service from making similar errors on future incoming documents. User will the create the purchase invoice by clicking on create document option. The User will upload the document file(Image) into the Incoming Documents in the NAV mobile app. User will then click on Send to OCR Service option once the document is successfully uploaded. After waiting for some time till the document processing is completed, User will click in the. OCR Services can also be performed by sending an Email. Over here the user Emails the softcopy of the Invoice Document as an attachment to the Lexmark ICS Corp.
An Incoming document is automatically inserted into the Incoming Document Page once it is processed by Lexmark Corp. (OCR Service Provider) in NAV. The incoming document is already processed when it is created. So User needs to Click on Receive from OCR Service. The OCR Service in NAV 2017 has benefited by reducing the amount of time spent in the manual work of data entry. The more the OCR Service system is trained the more accurate results can also be obtained. 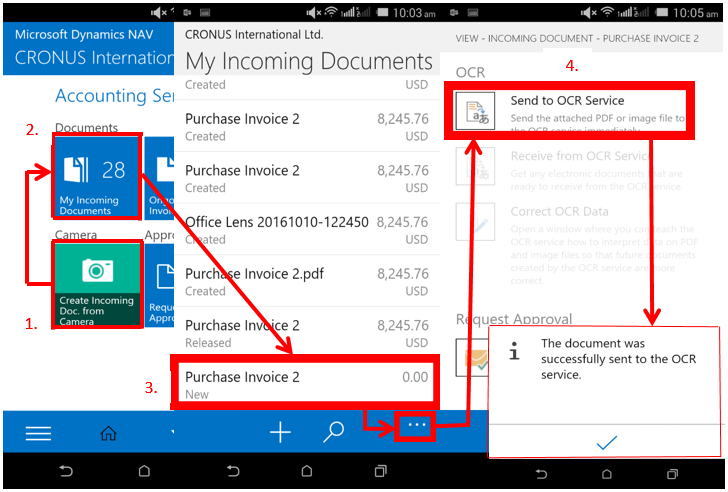 The best use of OCR Service in NAV 2017 is capturing of line items in the document sent to OCR Services.